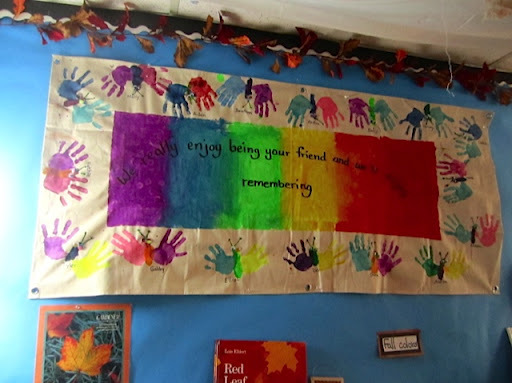 Displaying Children’s Artwork – Budding Artists! 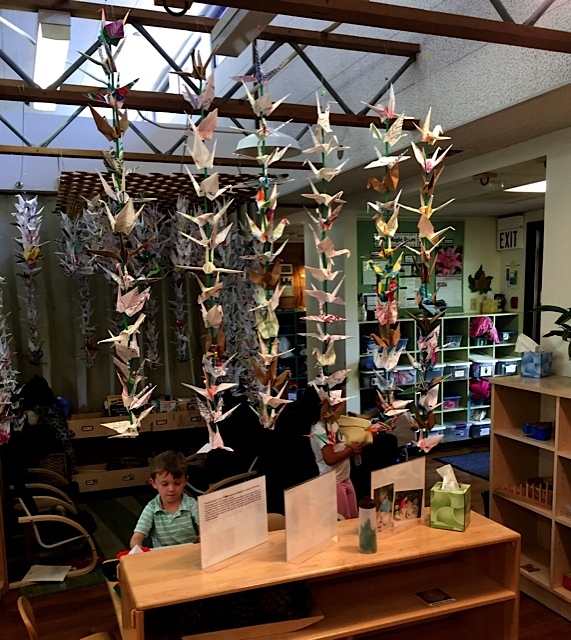 Wait until you see this exciting display of children’s art from the College of the Canyons, and how open-ended preschool art looks when it’s beautifully displayed. 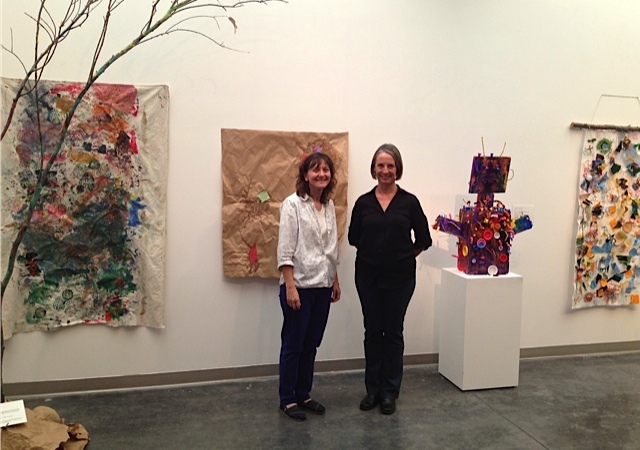 This unique art exhibit was coordinated by CDC Director Monica Marshall and master teachers Kathy Walker and Faby Marton. 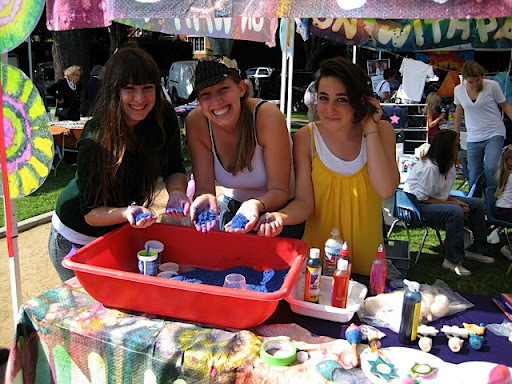 You’ll see a wide range of creative paintings, weavings and collage, and some unique 3-D art applications. Get ready to feast your eyes! I was particularly moved by the branch weavings that were inspired by reading Margaret Musgrove’s The Spider Weaver, a legend about Kente cloth weaving. 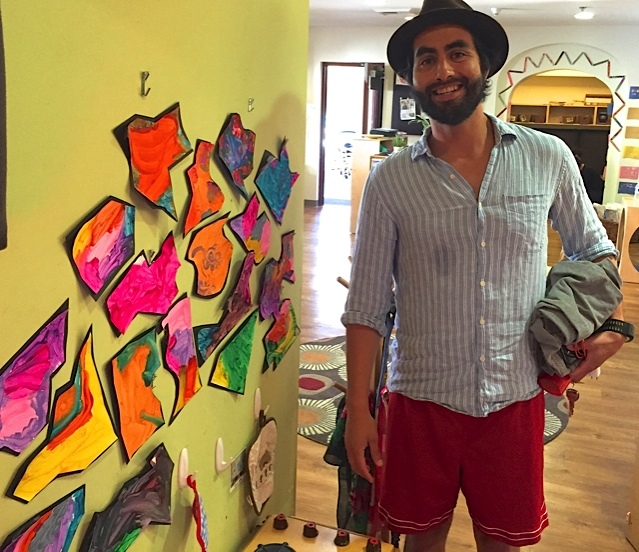 The exhibit included children’s thoughts about the story itself. 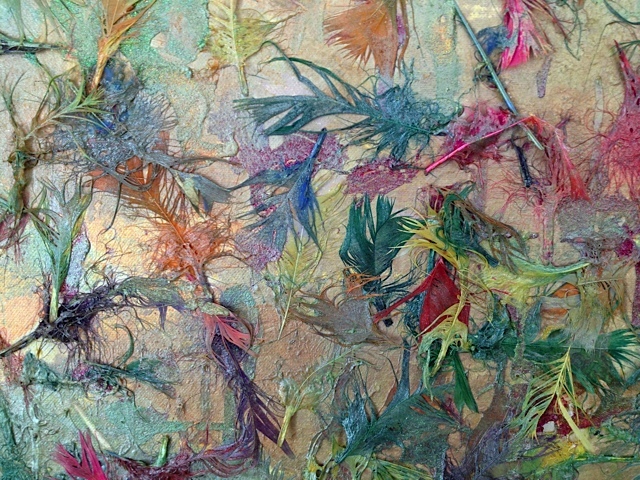 One of the branch weavings was done on burlap and a second version was created without burlap. Here Kathy Walker shows off the branch weaving without burlap, and comments that the burlap inset made it much easier for young children to weave. That’s something I wouldn’t have thought of, but it makes good sense as the burlap offers a large, loose fabric that big needles can carry yarn through. Nice to know! 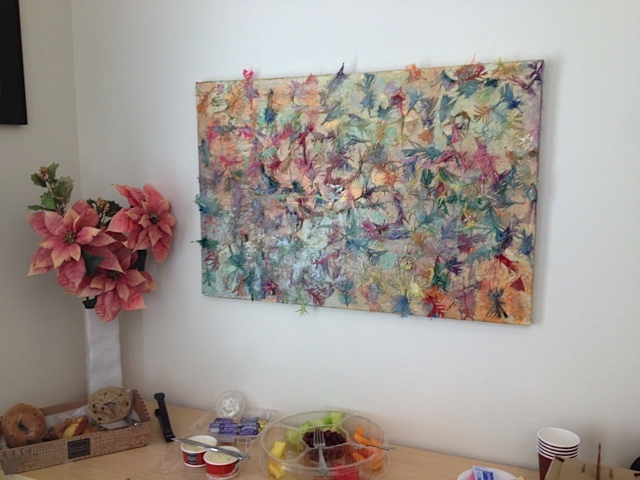 These process paintings and 3-D constructions show that you can paint and collage onto practically anything. See if you can find the cardboard fruit inserts or paint stir sticks in these photos, they are the foundation for two of these wonderful creations. 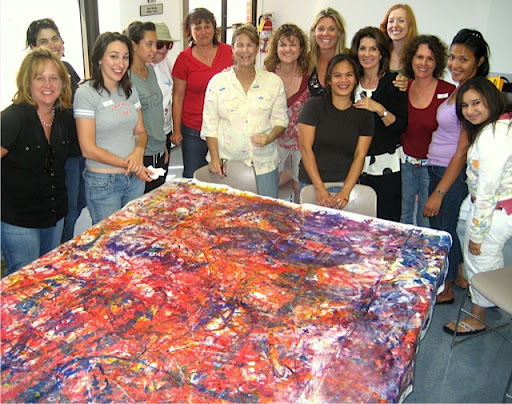 Thanks to Monica Marshall, Director of the Child Development Center at College of the Canyons and to the Fine Art Department and Art Gallery Director that made this campus collaboration possible. 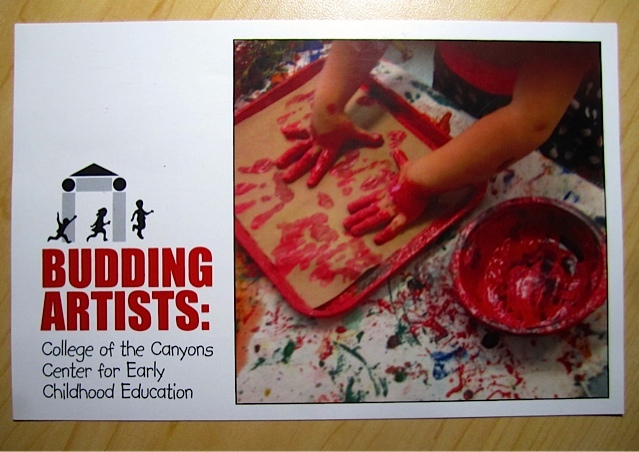 The exhibit will was up for six weeks and included a beautiful color postcard called Budding Artists. 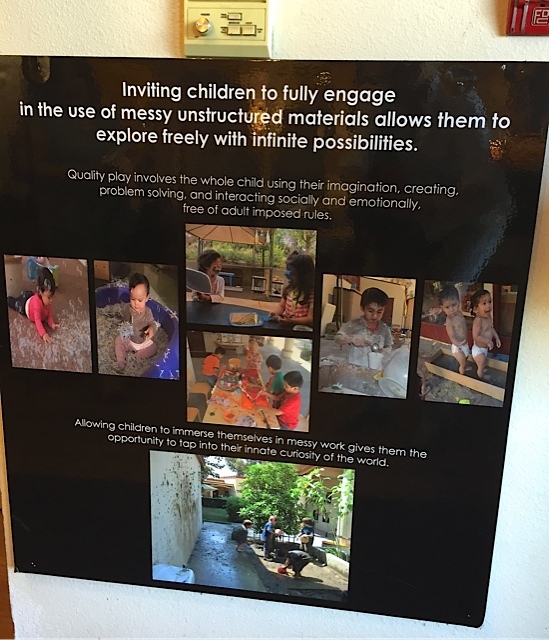 This awesome exhibit made me think of a story I recently heard from Anne Broussard, the delightful and highly experienced Child Care Coordinator at County of Orange. Knowing how much I love art, Anne told me this thought provoking story. As part of her job at the County, Anne was assigned to entertaining foreign diplomats and teaching them about early childhood education in the US. One afternoon she had guests from Iraq who were very interested in our preschool education system, so she was giving them a classroom tour. 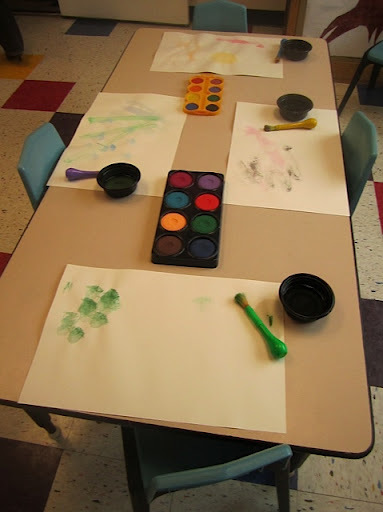 Her guests noticed some abstract art on the walls of a preschool classroom and asked her if a visiting artist had taught the children how to paint. They found it surprising to find so much art on the walls of the preschool, and were curious about it. 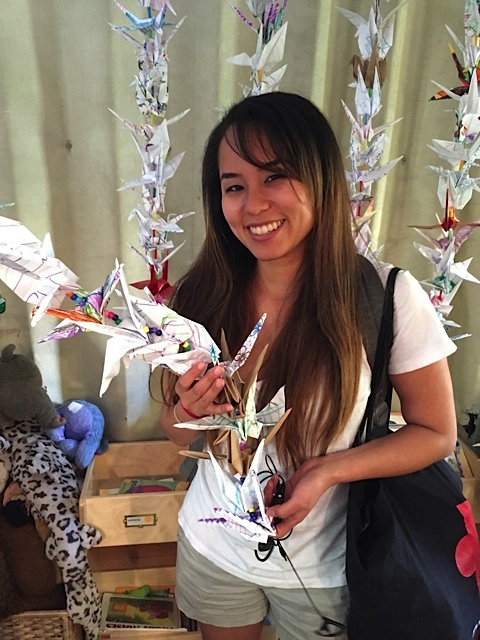 She told them preschool teachers in America are taught to give children the opportunity to make art naturally, to follow their own instincts without imposing adult rules or values. 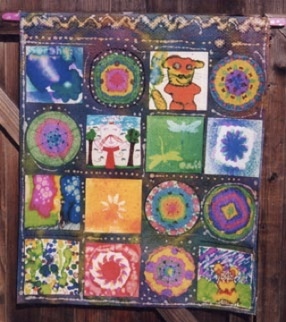 The educators from Iraq were stunned, they really could barely believe that children would naturally create art that looked so “artistic”! 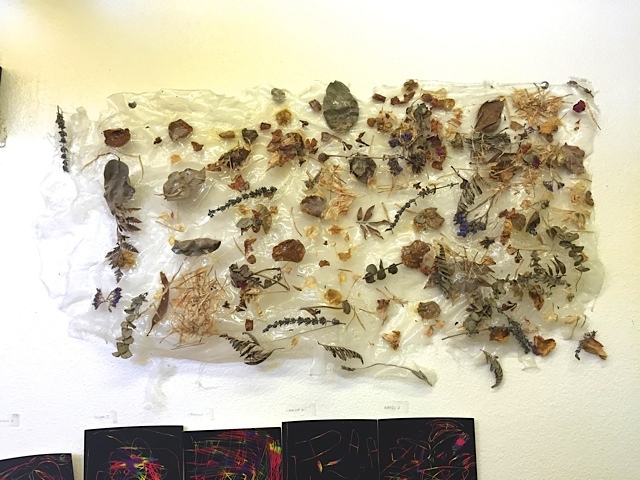 As this Budding Artist’s Exhibit illustrates, children’s natural creations are indeed very “artistic,” and it is precisely this open-ended discovery that gives art its true value. 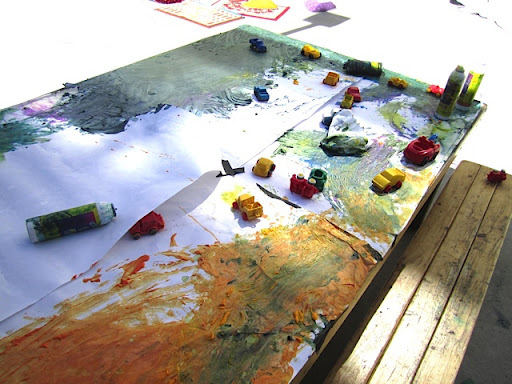 As children make their own choices with messy art, they discover the emotional pleasures of sensory and tactile play while developing important cognitive and social-emotional skills….skills that will help them in life. 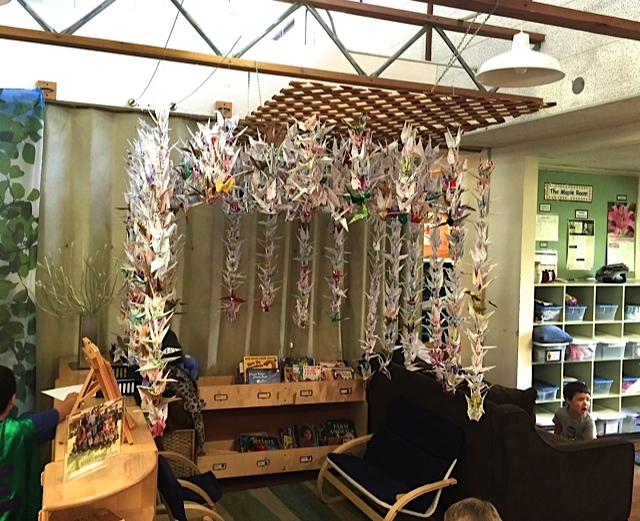 Here are some quiet corners that may give you fresh new ideas to de-stress your classroom. 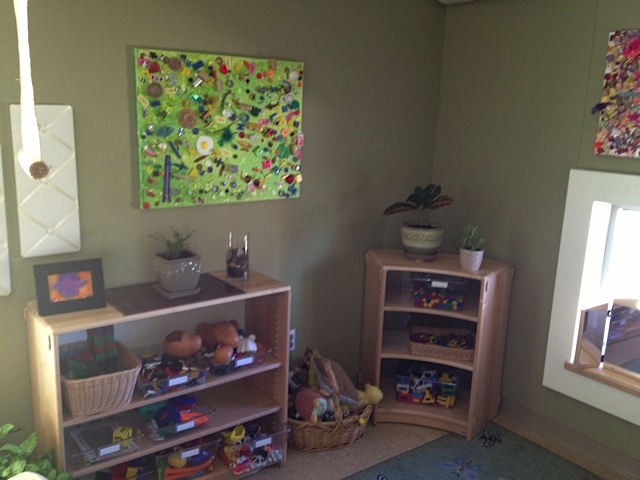 This quiet corner at Pressman Academy includes plants, soft lighting, artwork and soft butterfly pillows. Does it warm your heart? Does it make you feel safe? Quiet corners benefit from soft drapery that foster feelings of security and protection. That‘s a key benefit of the My Little Haven Canopy which hangs in Catherine Scott’s Family Child Care. This product creates an instant quiet corner for just a $50 investment. If you’ve been wanting to create a quiet corner but haven’t had the time, this product is for you, it hangs immediately with no assembly. Just add soft pillows and books….voilà! Quiet calm is also provided in reading areas, where soft furniture can encourage rest and relaxation. This reading area is so relaxing, it serves double duty as a quiet corner. 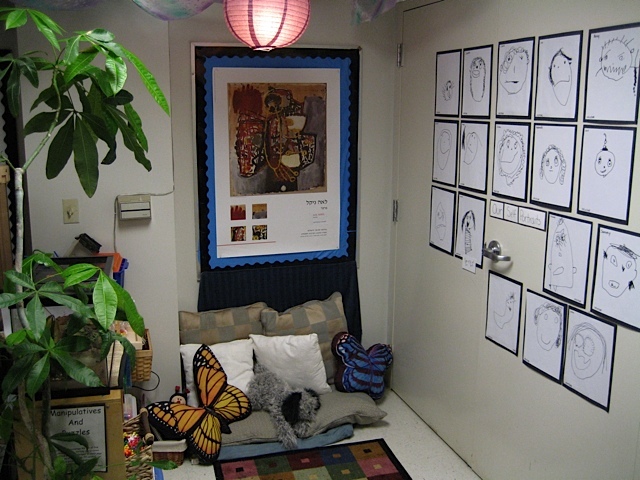 A cozy reading space provides children who struggle to focus a quiet place to learn. Dr. Becky Bailey, a leading expert on reducing stress in early childhood, just published a new book called I Can Calm. Her book promotion states: “Children who are stressed or upset cannot access the higher brain states necessary to problem-solve or learn. 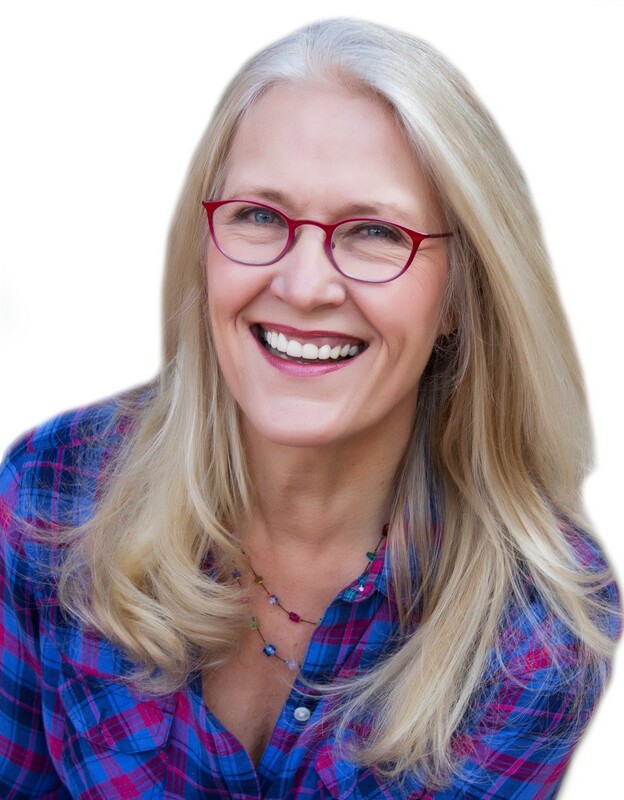 The I Can Calm book includes six simple deep breathing techniques proven to help shut off the fight or flight response.” What a timely book for us all. 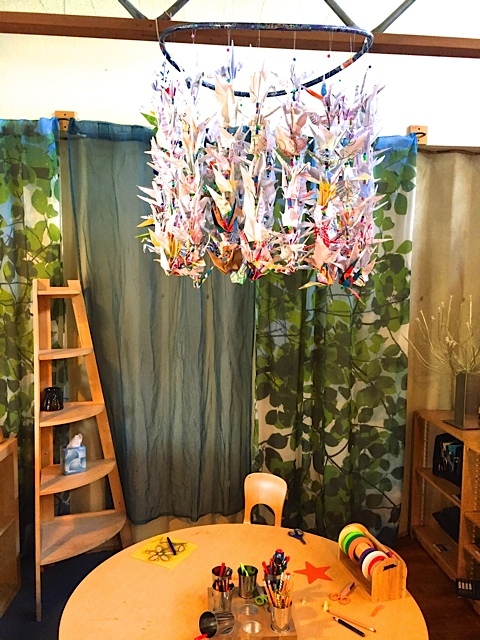 While quiet corners and reading centers provide children with a quiet space to deal with feelings, another calming classroom tool is the sensory table. 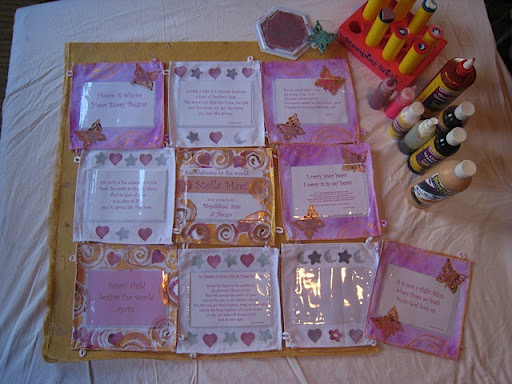 Soft sensory bin materials provide children with the opportunity to self soothe through tactile stimulation. 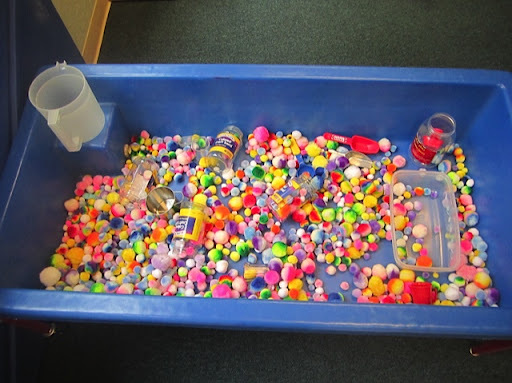 The sensory bins pictured here are filled with rainbow pom poms and pink Bubber™ with , both sensory products that are good choices for their potential to reduce stress. Lastly, here’s the Hideway Log Chair with Cushion, my personal favorite. This unique “cozy pod” comes with a removable “leaf” cushion and folds flat for storage. Like the My Little Haven Canopy above, it transforms any place in your room with a quick calming solution. Young children often deal with conflict, frustration and over stimulation. Teaching them to take time in a quiet space now to deal with those feelings is a skill they can benefit from now and in the future. 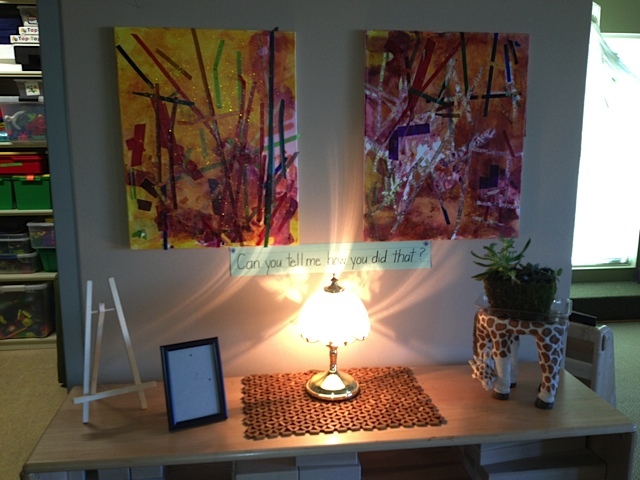 What do YOU do to provide children with message, “I can calm”? Please share your ideas with us here, so we can all have a more relaxed and stress free 2013. Enjoy a print out of this “Take What You Need” poster and have a wonderful start to the New Year. Welcome back to school! It’s a fresh new school year and the season of beginnings. Many of you already have classrooms filled with eager, bright and often shy new faces. Others are busily preparing for that exciting first day of class. All of us, whether we are teachers, parents or simply “grown ups” who love children are eagerly anticipating a year of joyful learning. 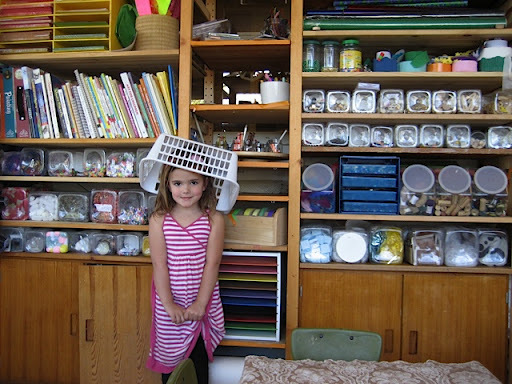 Let’s explore how ART ties in with those first exciting weeks of school. 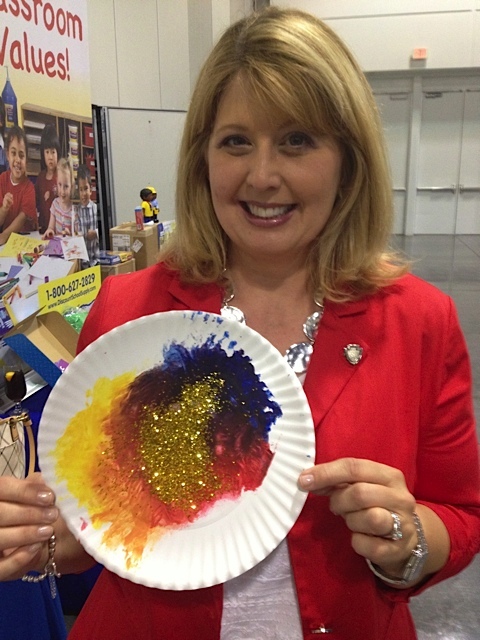 How do YOU use art to help children engage in your classroom? 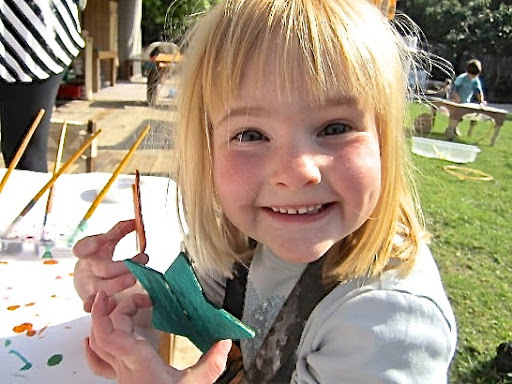 Here’s a useful handout to send home with parents as school begins – it helps them understand how they can partner with you in using art to help children grow and become their best selves. Recently I asked a group of seasoned teachers about their favorite “first art project.” Several responded with SELF PORTRAITS, I liked that! But given that there are so many drawing materials to choose from for a self portrait, where is a teacher to begin? I love the use of BOLD permanent markers for early self portraits. 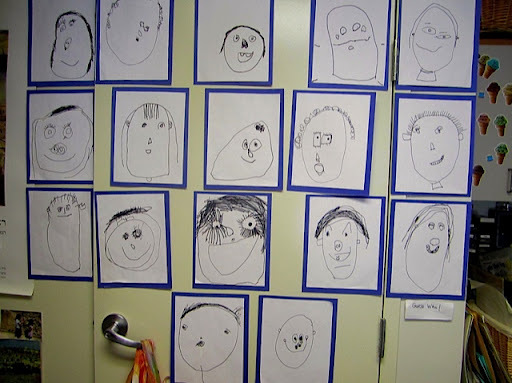 Here are some examples of back to school self portraits from Francine Farkas’s 4-year-old class. Francine gives children bold, permanent markers to draw with so their portraits really “pop” on the page. 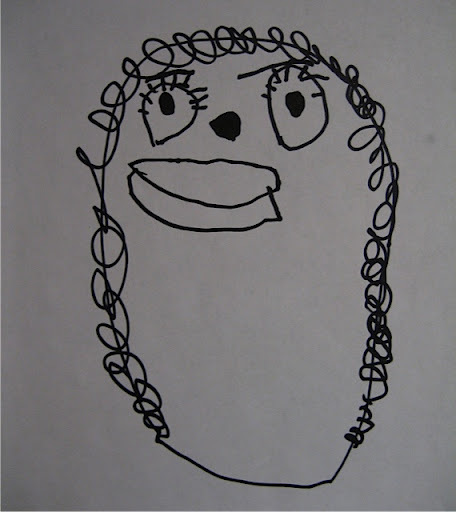 She keeps these initial self portraits in her children’s Art Portfolios (more on that in a future post) and they will serve as a “baseline” drawing of each child’s development when the year began. Each portrait will be saved and shared at parent/teacher conferences and will serve as a valuable reference point for measuring developmental growth as the year goes by. Francine mounts each portrait onto construction paper to emphasize the importance of each one and to create an “art gallery” effect. 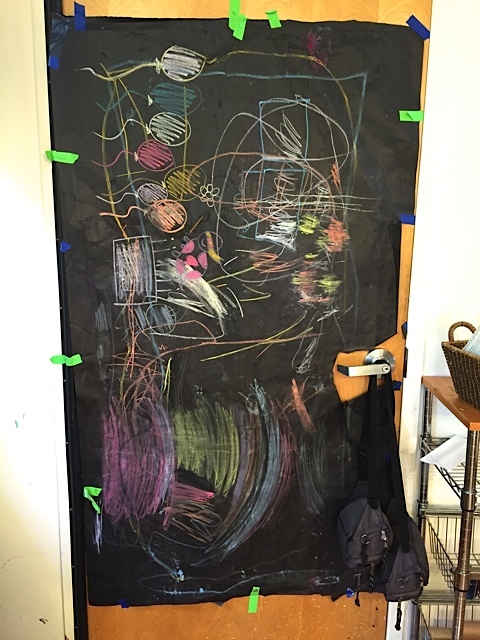 Because her classroom is not so large, she uses the supply door closet as a gallery space. 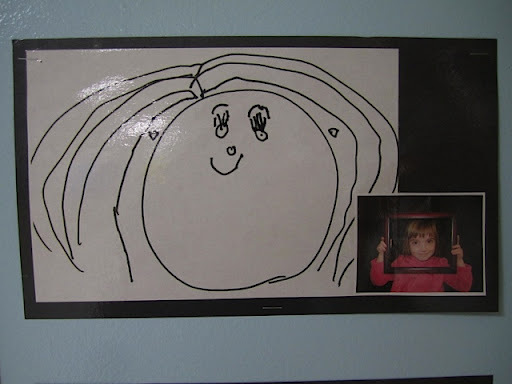 The teacher next door took a different approach to her “first art” self portraits, still using bold permanent markers so the portraits “pop” on the page, but adding a photograph of each child. 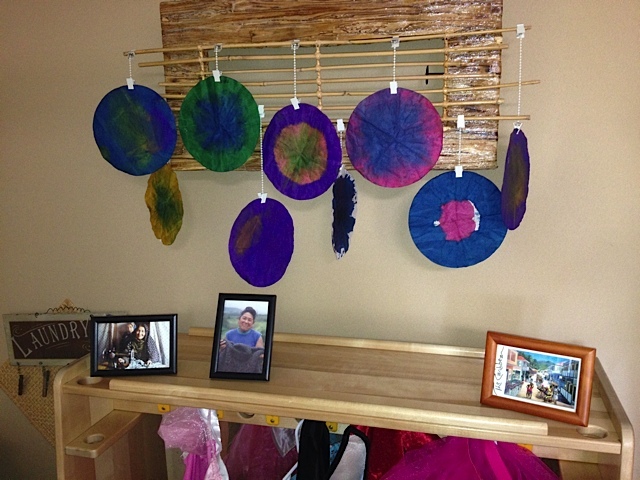 Look closely at the clever use of a blank picture frame held by each child in its photograph. 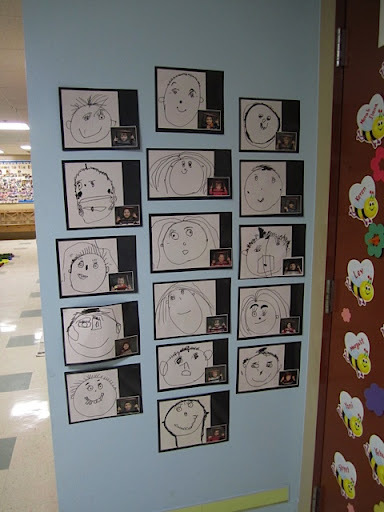 This teacher’s laminated self portraits hang outside her classroom door. What a delightful way for both children and parents to be greeted at the start of each new day. 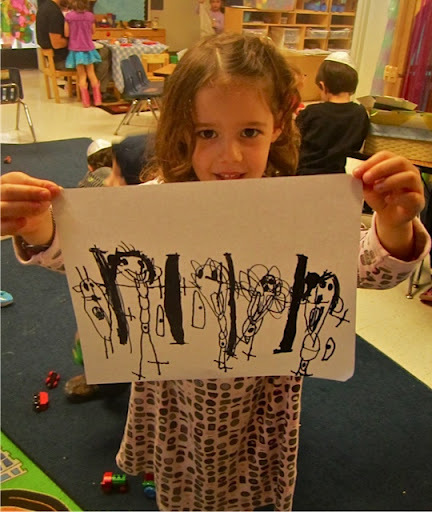 Teachers in the four-year-old classrooms at Pressman Academy often leave fine tipped, black permanent markers (PERMBLK) out for open-ended drawing, and as a result children create bold pictures with a sense of authority. 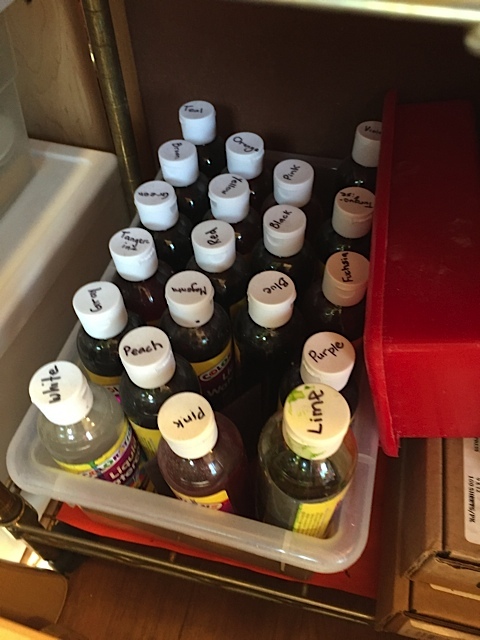 One other thing: When I asked my group of seasoned teachers for their favorite “art tip” to start the new year right, they said to offer lots of open ended exploration of art materials right from the start. This included the simplest idea of starting out with easy to use Colorations® tempera cakes (A8TCA) with Colorations® easy grip brushes (EGBRUSH). And moved on to including unusual sensory art ideas that children would not likely find at home. 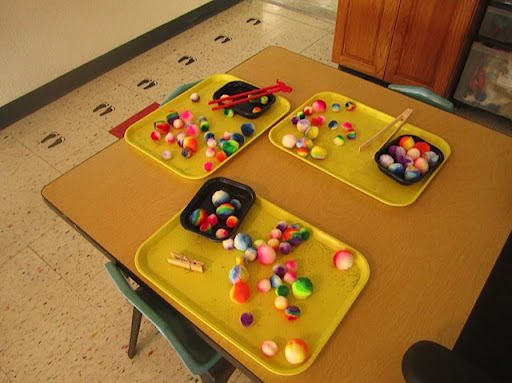 Such as these rainbow striped pom pom balls (COLORPOM) in a sensory tub (TUBS) which I saw in one classroom, and those same colorful pom poms in another classroom on trays with sea and zoo sticks (AP632J) and a variety of other pinch grippers. I loved both these applications! And I also imagined several other things we might do with these same colorful, oversized pom poms. Have a wonderful new year, and don’t forget to stock up on fun new art materials to inspire your students and keep YOU feeling inspired as well. Sometimes I feel like I work with angels. I just heard the most inspiring Conference Keynote and felt so proud to be a teacher. I was standing in the back of the room, listening to a Superintendent of Education inspire a room full of educators, all readying themselves for the new school year cycle. What’s not to be proud of when you realize how much the world needs good teachers? 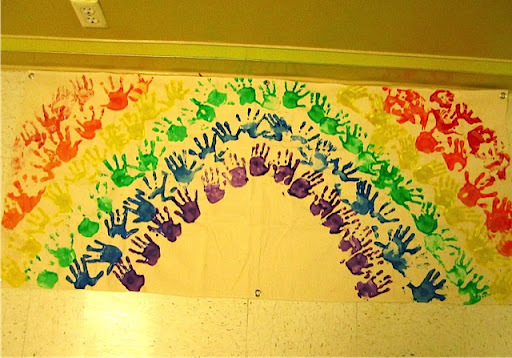 With inspiration in mind, I’m posting some of my favorite Collaborative Art ideas to help put you in the mood for a creative summer, and to prepare you for working with your new students this Fall. 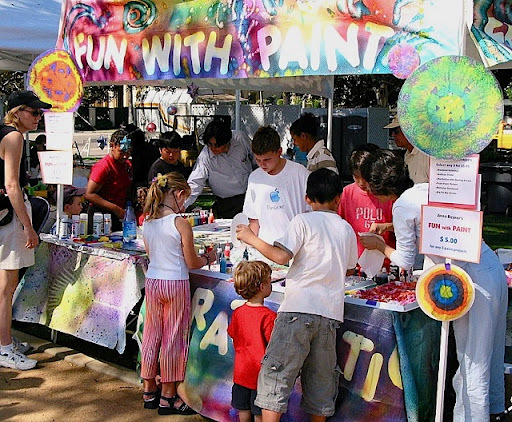 Collaborative Art can be such unifying, positive group experience, and open-ended art is a great way to bring people together in a feel-good kind of way. 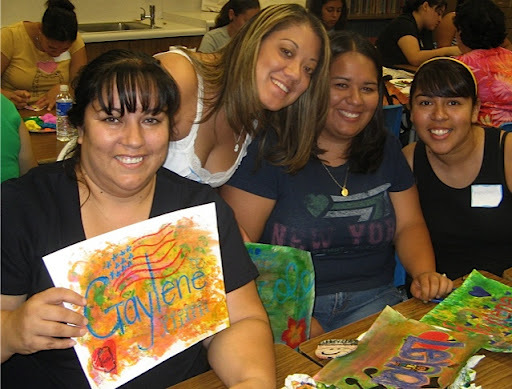 The teachers from Stephen S. Wise Nursery School are photographed here at a back to school Pre-service, making their own Collaborative Art fabric murals with BioColor®, paint scrapers, and Colorations® Washable Glitter Paints. 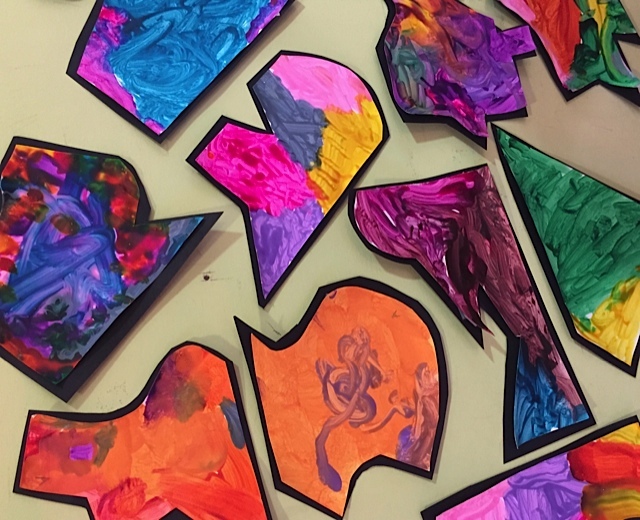 Incorporating hands-on art into your Pre-service is a good way to start the year off, and reminds teachers about why art making is so important to both intellectual and emotional well being. 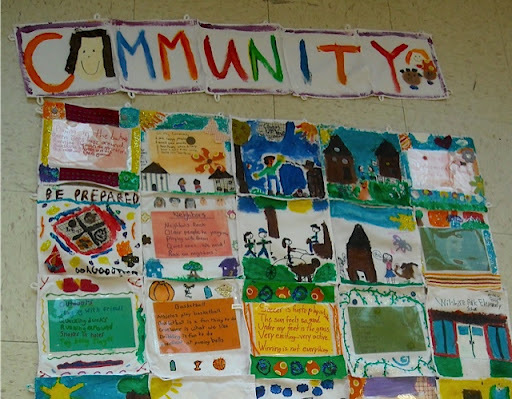 Here’s another collection of my favorite Collaborative Art ideas from classrooms I have visited this year. I hope they inspire you to do art in a group setting soon. Please send me YOUR favorite ideas and I’d be happy to include them in a future post. What a great time to work in education, our challenges are greater than ever and there’s no better time to work in a field that contributes to the well-being of children. Have a good summer and rest well so you can get back into the classroom this Fall and do your best work. And remember to learn to reward yourself for working in a field that makes a positive contribution to the world. Because a teacher really does affect eternity – you will never know where your influence ends.